Let us give your event a unique twist with our carefully researched selection of cutting-edge professional sound, lighting and AV equipment. Our experienced, knowledgeable team is on hand to offer a complete range of professional services, including event production, staging and rigging, plus service and repair packages. Twisted Audio is led by Barry Williams, whose expertise has taken the UK dance scene from strength to strength for over two decades. Twisted Audio is proud to partner with Void Acoustics and a repertoire of other cutting-edge brand names to offer sales as well as hire. We specialise in scalable systems to fit your budget, all of which can be added to at a later date without having to start from scratch. 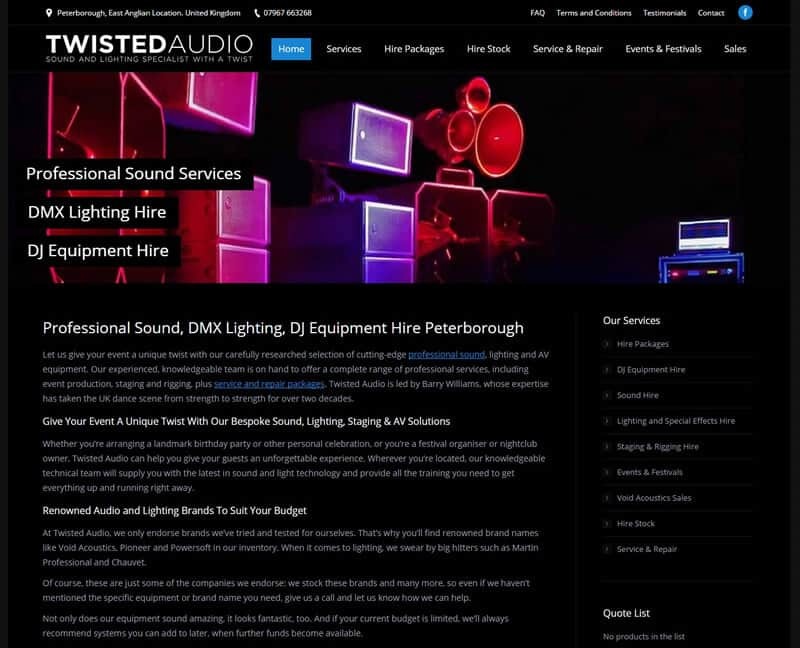 Our expertise extends beyond sound into lighting, special effects and staging, so whether you’re a club owner looking for sound systems or a theatre company in search of lighting solutions, we can help.